What are we doing in our school curriculum at Bogong? 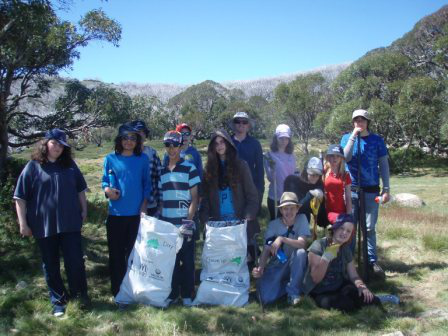 The Bogong curriculum is rich in learning about environmental sustainability. Students work in pairs to perform this duty each morning and evening. It is their job to cover the whole of the accommodation area and common rooms, monitoring what lights and heaters have been left on. The students then turn the lights and heaters off and provide a report back to the whole student group on the number of items left running. This is then equated to a carbon amount using the black balloon model, and then this is discussed as a group as to the impact of carbon on the environment. These impacts are then discussed in terms of the Bogong site and also at the home/school site. As the week unfolds the twice-daily duty of energy watch looks for an improvement in the use of the heating and lighting. Students are also directed to come up with a range of strategies to decrease their energy use while at Bogong. These are employed as the week goes on and their effects are monitored and discussed in relation to home applications. Outdoor School Bogong was formally the hub of the Kiewa Valley Hydro Scheme in terms of administration and accommodation. This gives us a great platform to work with students in groups around the benefits of hydro electricity generation and onto other renewables. Students will visit models of the scheme, a number of scheme sites and they will also visit an actual power station and gain an understanding of how hydro electricity works. From here we talk to students about making choices in the type of electricity their houses may be using, and encourage them to have discussions with their families around electricity usage with a view to selecting a greener alternative to coal. As part of their duties, students weigh and record the daily compost generated from the kitchen. The students then empty the bucket into the compost bin and spin the tumbler. Students are educated in the workings and benefits of compost and are encouraged to become involved in composting in their home environments. Bogong has an extensive recycling system encouraging students to separate their waste and minimize waste. Students also participate in Clean Up Schools Day each year. Students at Bogong are immersed in water education on a daily basis. Discussions about water occur when students are out in the field. They could be canoeing and conducting ‘Water Watch’ activities, collecting and drinking water from pristine alpine environments while out bushwalking in the high plains, participating in ‘The story of a River’, or skiing on manmade snow requiring large amounts of water. 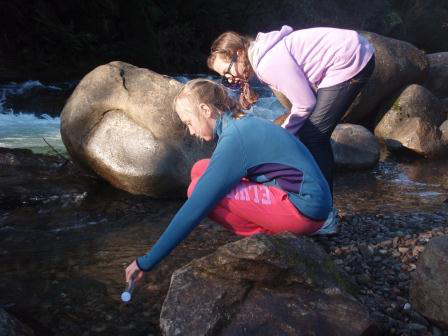 The students also take part in the Bogong Water Challenge. This challenge encourages students to use 4 minute water timers when they shower, to challenge each other to do the same, and to continue this behaviour when they return home (see resources). We find the fact that we are enveloped within the hydro scheme both at Bogong and on the high plains that we are able to reference it regularly and discuss its impacts. Teachings around hydro then usually lead onto water usage and its origin. The fact that we are at the head of the catchment for most of our student’s water supply enables us to work through the many environmental issues that surround water and make that important link back to the student’s home area. Bogong commenced Waterwatch testing at the beginning of 2012. Water quality is tested by students at our two sites (Lake Guy and Rocky Valley Creek) three times a term. The data is then uploaded onto the Waterwatch Victoria website (see links). View the Bogong Water Challenge. We are in a unique position here at Bogong to be able to educate our students about biodiversity through their experiences in the field. In their every day activities students learn about issues relating to: weed species/invasion, feral animal impacts, natural cycles and plant/animal adaptations and protection, weather, and endangered species. One particular endangered species that we teach about at Bogong is the Mountain Pygmy Possum (Burramys Parvus). Bogong is about to open it’s new Student Learning Centre. Within the centre we are looking to have a number of different animal species as part of our Captive Animal Program. Watch this space for further updates on this. In the past we have facilitated a catch and release session (animal trapping) which has temporarily suspended due to recent bushfires. Every week students take part in two sessions especially dedicated to environmental studies – Bogong’s Backyard and Bogong At Night. In this time they may explore the Environment session, take part in activities such as Tree Id, weed eradication, and experience our permanent sensory blindfold trail. Part of the curriculum at Bogong involves students collecting weather information from our on site electronic weather station and communicating this information to the whole student body at set times each day. This is an important part of the Bogong experience as it relates to the conditions the students are experiencing on a day-to-day basis. Bogong adopts a food waste reduction program where students are consulted in the food that they wish to eat, thus not serving up or creating meals that students will not eat. Students make their own breakfasts and lunches, making choices and using the ingredients that they enjoy. The main evening meal revolves around carbon education. The level of carbon created for each meal is calculated and discussed and the impacts of this again are highlighted both in the alpine area and in their home school location. Students then explore ways in which to reduce the footprint of their meals. While staying at Bogong, students are introduced to ‘Nudies’ – lunchboxes that carry food without any form of wrappings. This has been a Bogong tradition that goes back a long way. Students are given tips for packing without wrapping and the reasons why are discussed. The quality of the food, the type of the food, the lack of wrapping and the reduction of waste are all talked through with the students so they have an understanding of why their meal is served the way it is. 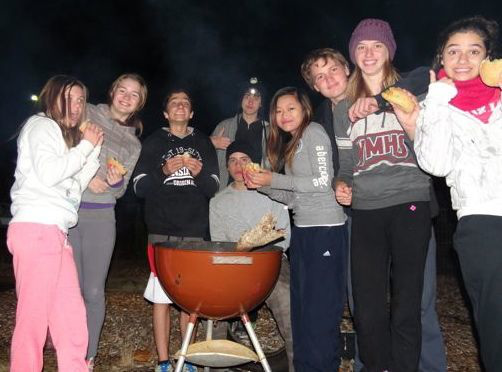 A ‘meat-free’ meal occurs on the students first evening at Bogong, along with education about the comparison between a meat based dish and a vegetable based dish in terms of a carbon cost to the environment.